In 1995, Krist formed JAMPAC (the Joint Artists and Music Promotions Political Action Committee). JAMPAC is a political action committee committed to protecting freedom of expression for musical artists and freedom of choice for music consumers. JAMPAC believes that all forms of music are artistic expressions that merit First Amendment protection. JAMPAC lobbies against censorship and other legislation detrimental to the cultural and economic vitality of the Northwest music community. Krist is a dedicated leader on behalf of artists, music fans and music industry professionals alike. As an activist, artist and filmmaker, he continues to champion free speech and the First Amendment. JAMPAC was orginally formed to lobby against a bill that would make it easier to censor music. Today, he is still the Founder and President, and has made trips to the United States Congress to plead his organizations' case. JAMPAC is also committed to numerous different community projects, and has begun to make some noise especially in the Northwest political scene. More recently, they were a major part in the lifting of the Seattle Teen Dance Ordinance, which had kept a lot of minors (under 21) from attending late night concerts and such. In 1998, Krist joined up with fellow musicians, actors and other political activists on the The Spitfire Tour. The Spitfire Tour is a free speech tour used as a platform discuss issues involving global affairs. Created in part by human rights advocate Zack De la Rocha (Rage Against The Machine), Spitfire tours to college campuses each year, primarily in the Fall. 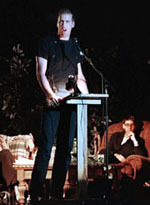 Each event features at least four speakers, who are all on stage at once, but that speak one at a time. Topics range from human rights, to environmental justice, to social issues, to current campus issues. It is our belief that grassroots interaction is the key to positive change. By providing information on serious topics in a fun and entertaining environment (which includes spoken word, acoustic performances, slides, video, poetry and more), we aim to inspire youth to get involved in their lives, their communities & in their world. In 2004, Novoselic did a national tour with FairVote to promote his book "Of Grunge & Government: Let's Fix This Broken Democracy!" FairVote's mission is acts to transform our elections to achieve universal access to participation, a full spectrum of meaningful ballot choices and majority rule with fair representation for all. As a catalyst for change, we build support for innovative strategies to win a constitutionally protected right to vote, universal voter registration, a national popular vote for president, instant runoff voting and proportional representation. In 2008, Krist replaced former congressman John B. Anderson (R-Ill.) as chairman of FairVote, a group that advocates ways to encourage voting. Anderson comes from a different realm entirely; he was an independent candidate for president in 1980. Krist is an active member of his local democratic party, the Wahkiakum County Democrats. In this role, he had been an elected Democratic State Committeeman, and considered a 2004 run for Lieutenant Governor of Washington (as a Democrat, challenging an incumbent of the same party), but ultimately decided against it. "I found out firsthand that it's really considered bad form to run against an incumbent of your own party," Novoselic noted when deciding against running.